Oh look, a feed from the past slips between my rotors. My being a new experimental hybrid of techno and human cortical splice implant, I receive information through my GPS to human memory mind-er system. I feel something like a murmur reaching into my being. Its cold up here in 2022 above the city. Murmmuration! 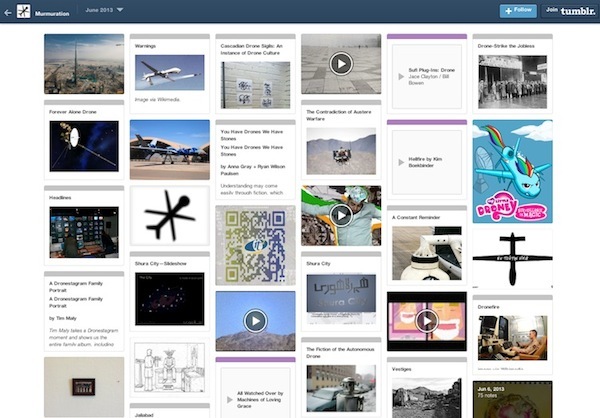 It’s a website from summer 2013. We are in the news species again. The topic of conferences and listed in the statistics of the Pew Institute. President Obama’s popularity plummets due to drone strikes in ‘AfPak’ as the military call it. I’m airborne, committed to urban service I understand. Did they ever notice way back in 2014 that it was a form of urban service design? Oh no, I am now implicated in the presentation and archiving of a drone festival online, a gathering of my own fairly recent history. Its collaboratively authored, even calling itself a design fictional space! 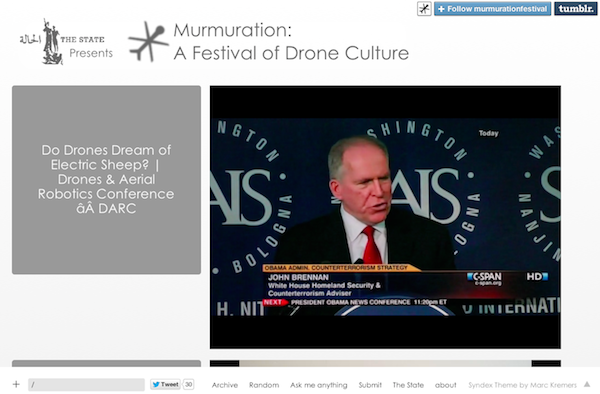 Call for contribution to Murmuration Festival, affliliated project at The State; The Murmuration Festival includes online video of news from C-Span; Archive shown.